Kangiqsualujjuaq is the easternmost village of Nunavik, located about 160 km to the north-east of Kuujjuaq. It is situated 25 km from Ungava Bay on the George River, nestled at the end of a cove called Akilasakalluq. Tidal movements reach as far upstream as the village so that, at low tide, water recedes almost entirely from the cove. Kangiqsualujjuamiut’s summer life is therefore closely linked to the rhythm of the tides. The village itself stands in the shadow of an imposing granite rock outcropping which rises to the north of the bay. Despite its northerly location, the valley sheltering the village is beautified by a luxuriant vegetation. In the 1960s, the village even operated a small spruce lumber mill. Kangiqsualujjuaq is the easternmost village of Nunavik, located about 160 km to the north-east of Kuujjuaq. It is situated 25 km from Ungava Bay on the George River, nestled at the end of a cove called Akilasakalluq. 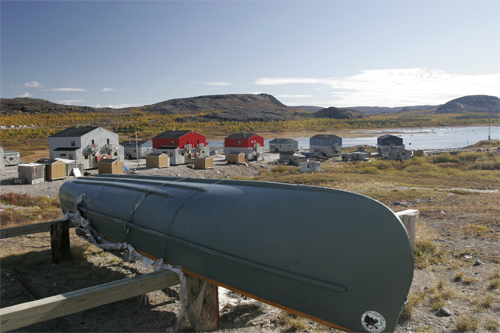 For hunters, anglers and adventure lovers alike, the surroundings of Kangiqsualujjuaq are full of natural attractions. The calving grounds of the George River herd, the largest ungulate population in the world estimated at several hundreds of thousands of head, is nearby. The George River, as well as other rivers in the area, teem with fish, particularly arctic char, Atlantic salmon and a variety of trout. At the site of the beautiful Helen’s Falls, 64 km up the George River, many outfitter camps welcome visitors and offer unbelievable fishing adventures. About 100 km to the east of Kangiqsualujjuaq are the Torngat Mountains. This range stretches for 300 km along the Quebec-Labrador border, between Ungava Bay and the Labrador Sea. Its eternal snow, glacial troughs, cirques, fjords and the majestic Mount D’Iberville which dominates the range at 1646 m make it an exceptional destination. The Koroc River, which flows from the Torngat Mountains all the way to Ungava Bay, as well as the Abloviak Fjord conceal countless natural beauties and are entrancing settings for hikers, canoeists and kayakers to explore. Also well-known as simply George River, Kangiqsualujjuaq did not really develop as a village before the early 1960s. The Hudson’s Bay Company operated a post south of today’s village during the periods of 1838-42, 1876-1915 and 1923-32. However, Inuit of the area never settled around the post, preferring to live along the coast in summer and setting their camps about 50 km inland in winter. In 1959, local Inuit established, on their own initiative, the first co-operative in Northern Quebec for the purpose of marketing arctic char. The construction of the village began in 1962 and, a few years later, all inhabitants of George River lived in prefabricated houses. A school was built in 1963 as well as a co-operative store and government buildings. In 1980, Kangiqsualujjuaq was legally established as a municipality. Excellent Atlantic salmon and arctic char fishing, as well as caribou hunting opportunities. Torngat Mountains including Mount D’Iberville which reaches 1646 metres. George River and Helen’s Falls. Wildlife observation: caribou, black bear, fox and wolf.